Our company offers a range of Hydraulic Shafts that are of superlative quality and features. These are used in following features. Keeping in mind the diverse requirements of our clients we are involved in offering to our clients a wide range of Hydraulic Piston Shaft. These are extremely durable in nature and are highly treasured among our clients for their high tensile strength and anti corrosive nature. 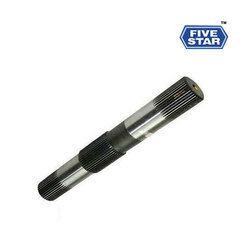 We offer high-end hydraulic shaft, which is made using optimum quality raw materials. We have emerged as a leading manufacturer and exporter in the market due to the superior quality of the hydraulic shaft exported by us. We mainly offer our products in kerala, Karnataka, Tamilnadu & Andhra Pradesh.